The West Elk Hockey Wolverine girls hockey team took over sole possession of first place with two wins over the Vail Mountaineers Saturday and Sunday, February 11-12. 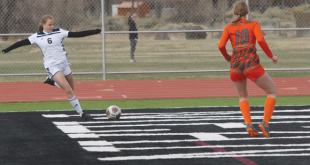 The Wolverines were sitting in second place behind Vail heading into the weekend but took control of the league in the first game, handing the Mountaineers a 6-0 drubbing. “We pretty much outplayed them the whole game,” says coach GJ Santelli. The Wolverines jumped out to a 2-0 lead in the first period, staving off a series of penalties before opening the scoring, when Kathryn Guerrieri skated in to score off an assist from Jansen Lucas 11 minutes into the game. The Wolverines tacked on a second goal later in the first period when Kendl Santelli slipped into position in the slot to push the puck through off an assist from Jansen Lucas. Izzie Dethloff put the Wolverines up 3-0 in the second period, taking a pass up the boards from Sophie Hall and skating in to finish, and the team converted on a power-play to go up 4-0 as Santelli won a face-off and dropped it back to Guerrieri at the point. Guerrieri fired her shot through traffic and the goalie made the initial save, but Jaden Cavarra was there to punch home the rebound. The Wolverines sealed the win in the third period as Sierra D’Aquila jumped on a loose puck to skate to net and finish five-hole and Dethloff capped the 6-0 shutout, firing her shot off the post and in. Two different teams showed up for the second showdown of the weekend on Sunday. While one of Vail’s players who was missing from the previous game was on hand to help energize the Mountaineers, a lethargic Wolverine’s team showed up for Sunday’s game. The two teams skated through a scoreless first period but the Wolverines finally broke the seal six minutes into the second period on a power-play. The Wolverines won another face-off in Vail’s zone and got the puck back to Dethloff at the point. Dethloff fired her shot through traffic and Hall tipped the puck off the shaft of her stick and past the Vail goalie. The Wolverines held their slim one-goal lead until the opening minute of the third period when Vail tied the game. The two teams traded attacks until Vail picked up a penalty late in the game. As they looked to clear the puck, Cavarra cut off the clearing pass and skated straight to net to score for a 2-1 Wolverines’ lead. Vail pulled their goalie but struggled to find the game-tying goal and the Wolverines held on for the 2-1 win to remain in first place in the league standings. “Now we got the bull’s-eye on us but we’re used to that,” says GJ. After a lengthy series of road games, the Wolverines will finish the regular season with four games at home and then set their sights on the post-season. They will host Summit for two games on Friday, February 17 at 2 and 5:15 p.m. The later game will be followed with a ceremony for the seniors on the team. 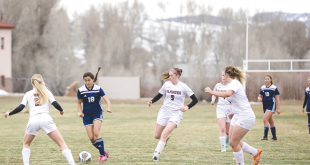 The Wolverines will then host Telluride on Monday, February 20 at 12 and 2:30 p.m.
“We’re finally home this weekend—it’s been a long travel season,” says GJ.